The Goodwills (Bob & Laurel Wilson) are a veteran folk duo who have been singing together for more than 30 years. In recent years, they have become known to a wider audience through radio play of Bob’s original songs like ‘Big Country Town’, ‘Underneath the Story Bridge’ and ‘Courting the Net’. Bob is an award-winning songwriter who plays six-string and 12-string guitar and harmonicas. He either sings lead or provides tenor harmonies to Laurel’s lead vocals. Laurel has a five-octave vocal range, which allows the duo to explore the depths of harmony and melody. Bob & Laurel do their own arrangements, utilising their close vocal harmonies. The duo’s ‘party tricks’ include switching parts in mid-song and even performing two different songs at the same time! Laurel’s original homemade instrument, the Kazoobugle, makes occasional appearances; they’ve been known to indulge in ‘harmony whistling’ and Laurel is often tempted to add hand movements to illustrate points in songs. The duo has produced five CDs since 1998. Although the CDs and live performances emphasise Bob’s original songs, The Goodwills’ repertoire is expansive and includes a wide range of musical styles. The Goodwills have played at major festivals in Australia, New Zealand and the UK, accompanied Ian McNamara (host of ABC radio show ‘Australia all Over’) on major tours in 2004 and 2005, and have appeared at many of the ‘Australia all Over’ outdoor broadcasts. 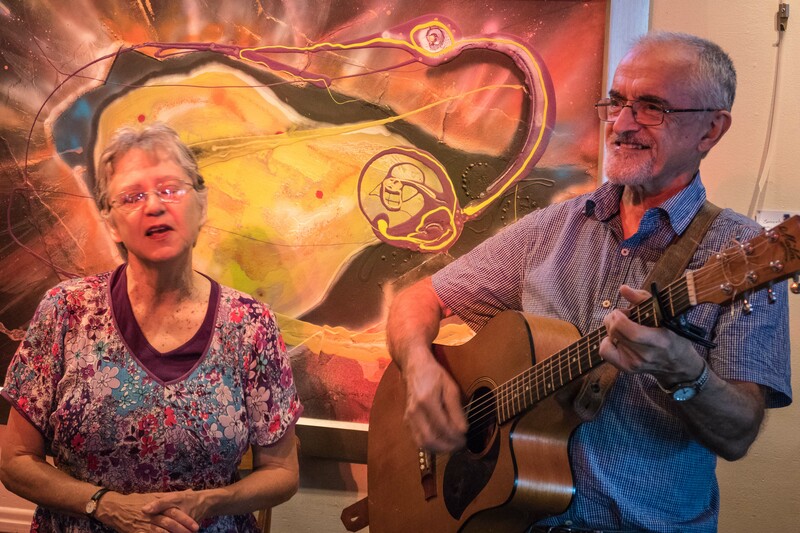 Bob and Laurel are also known for promoting independent talent through their series of unplugged house concerts; at first in Brisbane, and currently in their home at Maleny. Well-known guests have included Kieran Halpin, Rose Bygrave, Penelope Swales, Fred Smith, Sunas, Margret RoadKnight, Kath Tait and Cloudstreet. The Goodwills traditionally appear as the ‘resident band’ at these popular events. For the future, Bob and Laurel will be continuing with their house concerts and are looking at more travel in their little pop-top caravan. Laurel just ordered a car magnet that may just give the game away when The Goodwills pull into a new town. Watch this space for news of their travels.